My favorite hot weather dinner is a Caprese salad. Nothing too elaborate, just perfectly ripe tomatoes, fresh, milky mozzarella cheese, a few leaves of basil, and a drizzle of good olive oil. It’s the one thing I could eat that every night, June through August. There’s just 1 problem though. There’s always got to be something, right? So what is it this time? I live in Minneapolis, Minnesota. We had snow until May. It rained all through June. I think summer really just began last week. All this translates to a tomato season that won’t truly begin until mid to late August. I’ve got at least a month to go before I can actually start making my Caprese salads morning, noon, and night. But it’s hot now and that’s what I’m craving. I guess we’ll just have to improvise with what we do have. Okay, let’s see, we’ve got the basil covered. Mozzarella? No prob. And we have strawberries. Good, ripe strawberries. We can work with this. 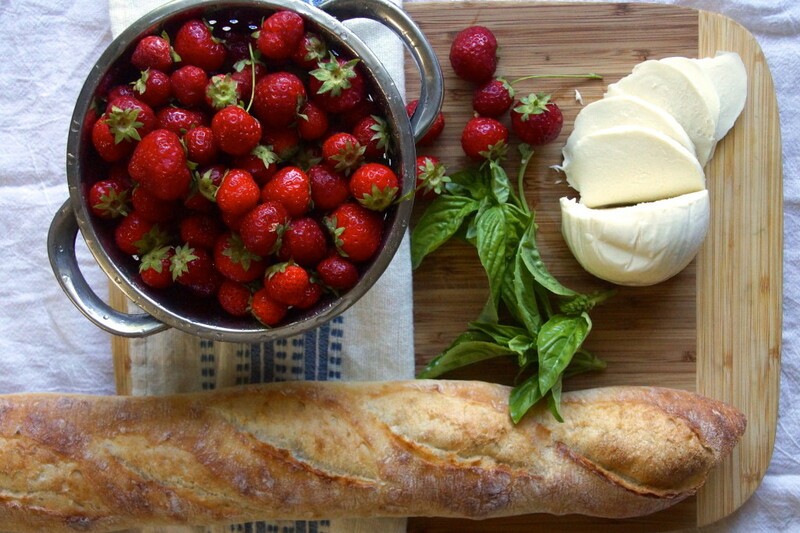 Strawberries will stand in for the tomatoes on Caprese bruschetta. We’ll cook them with balsamic vinegar and a spoonful of sugar until they’re sweet and jammy. Lemon peel will help thicken it up and a few pinches of salt will keep it from turning into dessert. Slice a baguette and make crostini. There are several ways to go about this. You could toss them in the oven on a sheet pan, but it’s probably too hot for that. Maybe you’re grilling something else to serve with dinner. Done–throw the bread on the grill. No? How about making them on the stove top? 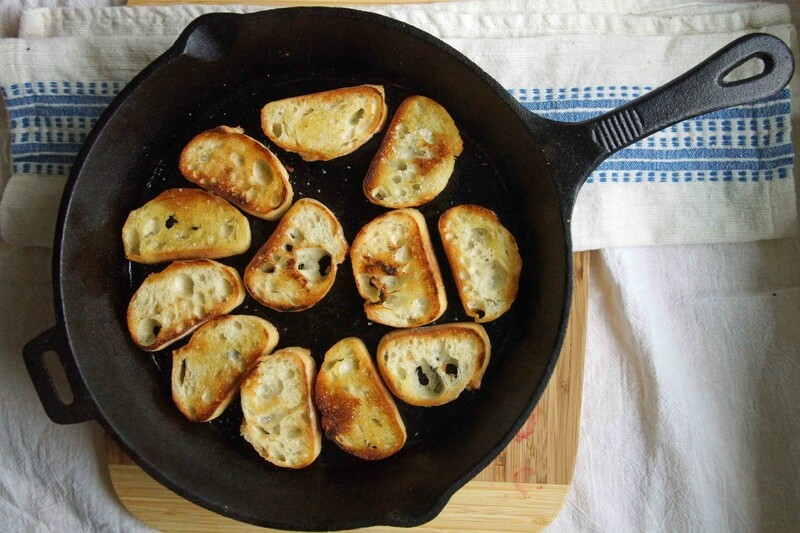 Just heat a little olive oil in a wide pan and toast the bread. Just be careful, golden can turn to black very quickly using this method. 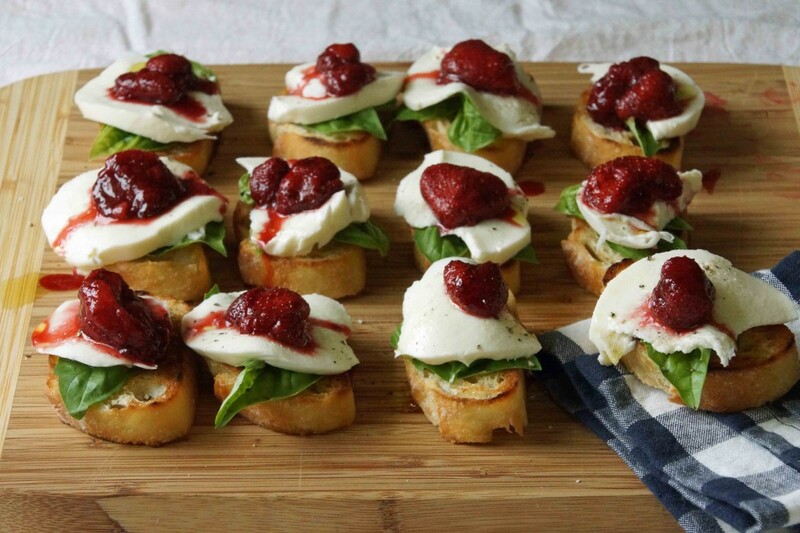 Top each crostino with a perky basil leaf and a slice of fresh mozzarella. Drizzle with olive oil, sprinkle with salt and pepper, and spoon the syrupy berries over the top. Oh yeah, I think this’ll do. In fact when ripe tomatoes do come around, we might find ourselves longing for early summer strawberries for our Caprese needs. Strawberries stand in for tomatoes in an early summer take on the classic Caprese combination. Combine strawberries with sugar, vinegar, salt, and lemon peel in a medium saucepan. Bring to a boil and reduce to a simmer. Simmer until the berries are soft and suspended in a thick, sweet syrup, about 30 minutes. Remove lemon peel and allow the cool slightly. The mixture will thicken as it cools. Make crostini. Heat about 1 Tbsp. of olive oil in a wide skillet over medium-high heat. Place the bread in the skillet and allow to toast and become golden. Flip and toast the other side. Sprinkle lightly with salt. Assemble. Top each crostini with 1 large or several small basil leaves. Cover with a slice of Mozzarella. Drizzle the cheese with a little olive oil, then sprinkle with salt and freshly ground pepper. Top with a couple of berries and their juices and serve. You won't miss the tomatoes a bit! 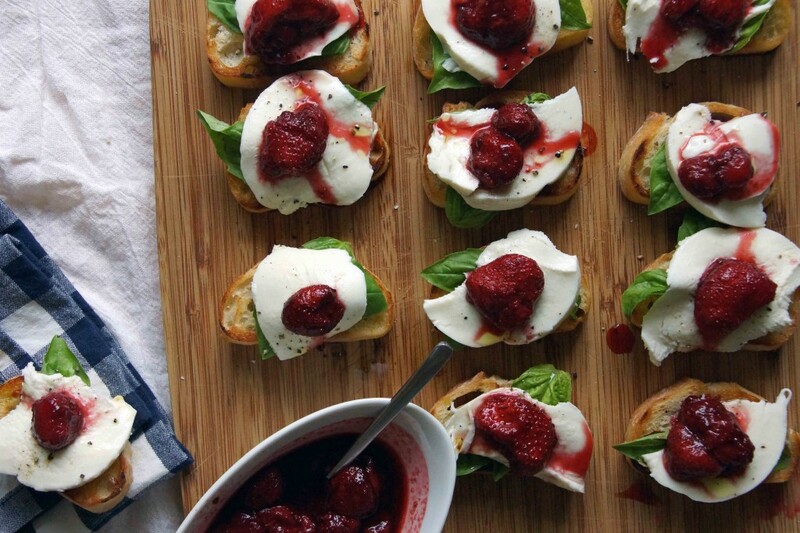 You will likely have more of the strawberry conserve than you need for 12 crostini. You could, of course, just make more crostini or you could add it to a prosciutto and brie sandwich, dollop them on a warm chèvre salad, or spoon them over ice cream. I love the combination of all of these ingredients. Strawberries make so many things delicious!